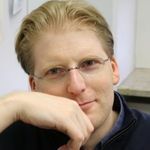 When I go on business trips or vacation, I usually do that in the mindset that Internet connectivity will not be as good as at home and that I will be restricted in some way. While in Europe, LTE coverage is usually good wherever I go and speeds are usually sufficient in the double digit Mbit/s range in both the uplink and downlink direction. That’s good enough for most things but outside of Germany, the amount of data I can use per month is still limited. Outside of Europe, things are worse but they are getting better. On the fixed line side I’ve long given up expecting decent Internet connectivity at hotels, with speeds in the double digit Mbit/s range in both the uplink and downlink direction being a huge exception rather than the norm. 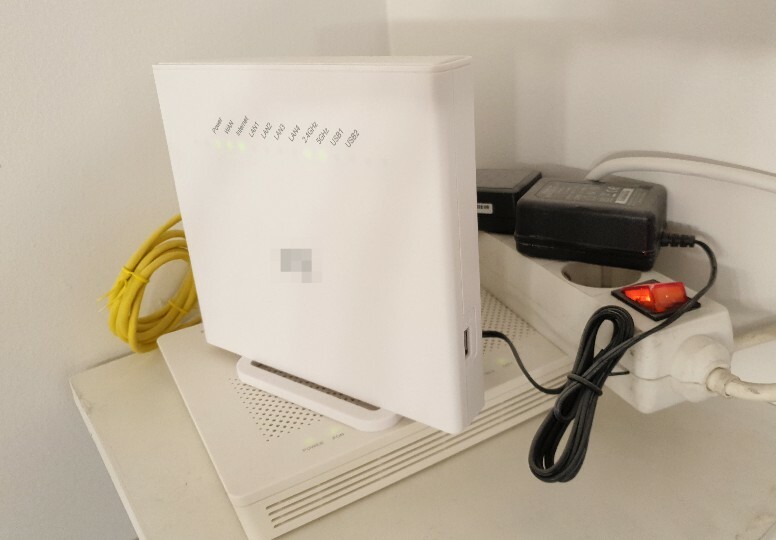 When I was recently in Malaga in southern Spain for a week, I went there with the same expectation but was very positively surprised about the triple digit up- and downlink speeds in the rental apartment. One of the first things I did after arriving was to casually connect to the Wifi network of the apartment and run a quick app based speed test on my smartphone to get a first status indication. You probably understand my surprise when I saw a sustained downlink speed of 100 Mbit/s as well as 100 Mbit/s in the uplink direction! Wow, must be fiber I thought and, as far as the uplink is concerned, much more than I have at home in Cologne with my vectored DSL connection and also more compared to my fiber link in Paris, which both offer 40 Mbit/s in the uplink direction. When I had a bit more time I opened my notebook and ran iPerf, which confirmed my initial observation. Breathtaking! 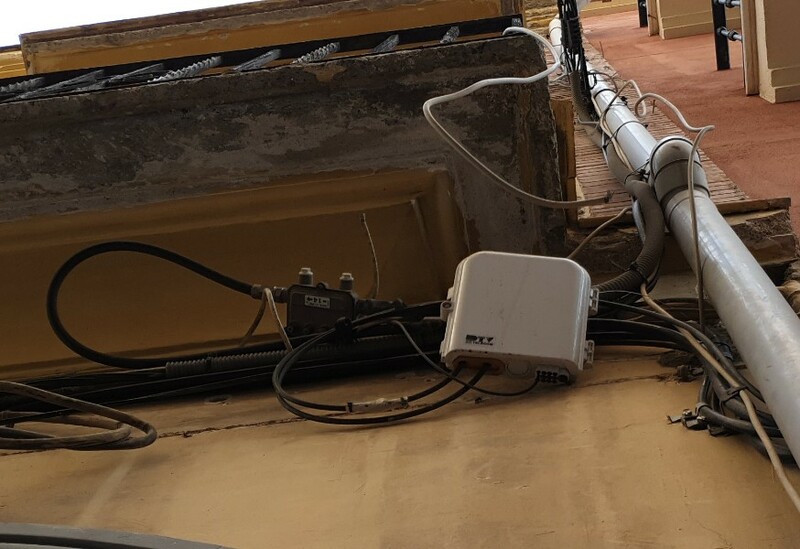 The Internet installation was not too hard to find, it was mounted over the apartment’s front door so I took a couple of ‘overhead’ pictures with the phone as I couldn’t see all connectors directly. At first I was a bit perplexed when I saw the cable TV connector. 100 Mbit/s in the downlink are possible over cable but the 100 Mbit/s in the uplink direction did not quite make sense if the TV cable was the source of the Internet. So I had a look at the bottom of the modem and found the GPON fiber connector. 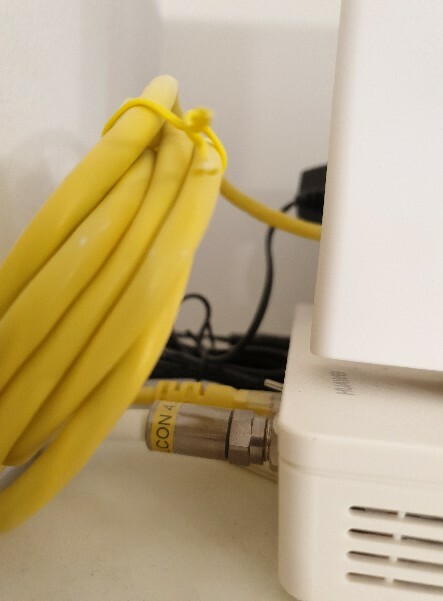 With the model name of the Fiber modem I downloaded the manual from the manufacturer’s website which confirmed that the cable TV connector is not an input but actually an output for the cable TV installation in the apartment. A ‘legacy’ connector so to speak. What I found a bit ‘suspicious’ was that the speed was 100 Mbit/s in both directions as that’s basically Fast Ethernet. 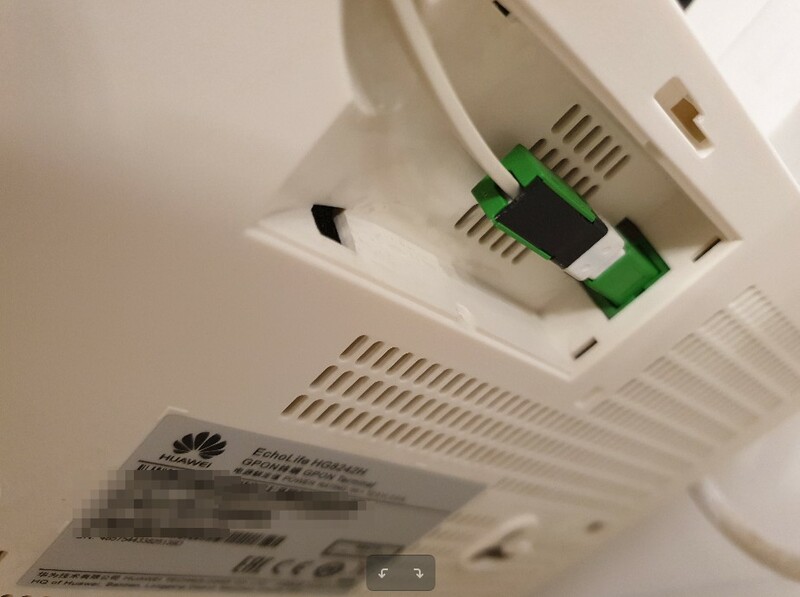 So perhaps the Fiber connection itself is faster but there is a limitation on the link between the Fiber Modem and the Wifi Access point on top? So I connected my PC directly to the fiber modem with an Ethernet cable but got exactly the same result. So I went to the web page of the fiber company and quickly found the answer there. While I was overjoyed to have such a fast connection it’s actually the ‘basic’ offer for around 38 euros a month. For a few euros extra a month, one gets 600 Mbit/s or 1 Gbit/s. No problem for GPON. Wow, I can’t remember when I last thought that a ‘basic’ option of anything was actually already fantastic. What I also like about the offer is that connectivity is symmetric. My vectoring DSL at home also offers 100 Mbit/s in the downlink direction but is limited to 40 Mbit/s in the uplink direction. And while I get around 270 Mbit/s in the downlink direction on my Paris fiber link, the uplink speed is also limited to around 50 Mbit/s. Many people wonder how countries like France and Spain get fiber into homes while other countries struggle. 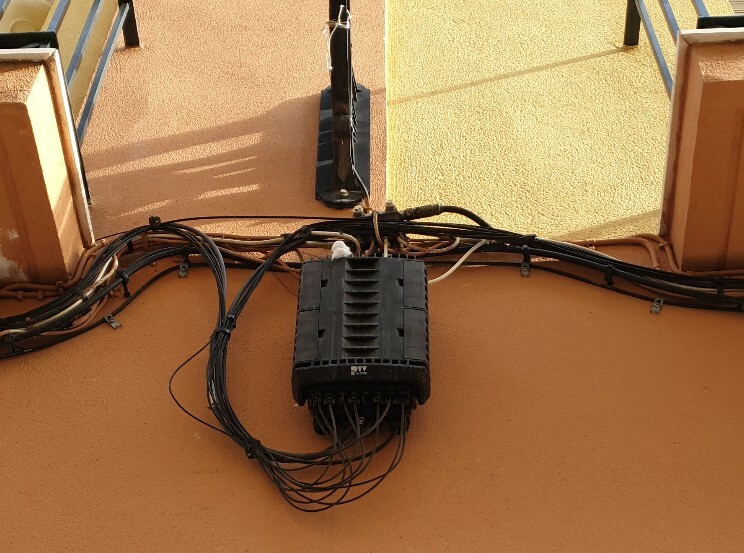 One reason for that is that outdoor installations are usually on the wall and via cables over poles rather than underground and in cable ducts like in countries such as Germany. The pictures on the left shows one good and one bad example of the outside cable installation in Malaga. Very unlikely that we would ever see something like this in Germany. Obviously doing things this way makes fiber deployment a lot faster and cheaper. And at least in my multi-year experience in Paris, where the fiber installation is of a similar ‘quality’, I didn’t have a single outage yet from torn cables somewhere along the line. More of the same in the future, please! Yeah, i am wondering also why in suburban areas in Germany where the Powersupply and the Telecomline is still on poles we are not deploying Fiber this way too. 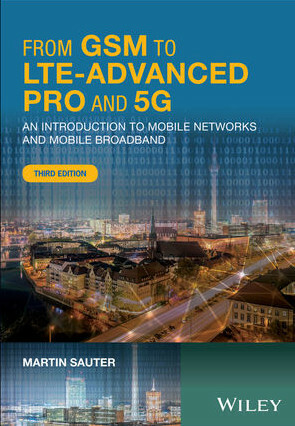 Next to all the regulatoric topics and the aim of the Deutsche Telecom to pupm up the datarates on the copper wires until they are rotten to verdigris, the paradigma to burry all the wires/fibres seems to be a huge braking parachute for the fiber deployment in Germany. Yep, I’ve seen pole mounted fiber lines in Mexico. They looked pretty new. Probably the easiest way to get fiber to the people quickly. In the US, things vary enormously by state, county and locality. For example, many parts of northern Virginia can subscribe to Verizon’s “FiOS” GPON service where speeds are symmetric and the maximum tier is pretty close to gigabit. But where I live (about 40 miles away), FiOS is unavailable and the Comcast (the local cable TV company) offers DOCSIS 3.0 service that has a maximum speed of about 200M downlink and significantly slower uplink.